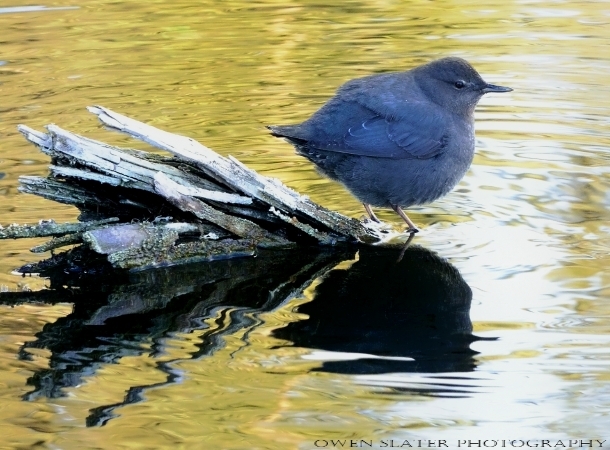 An American Dipper takes a break from hunting to fluff its feathers. Birds will do this for a variety of reasons. In this case the dipper purposely fluffed the feathers to trap air between the different layers. This serves two main functions. One is to keep the warm air close to the body to maintain its body temperature and the other is to get enough air between the feathers to improve buoyancy when diving for food. By doing so, it easily floats back to the surface with minimal effort despite being weighed down by whatever food it manages to catch. A sick bird will also appear fluffed but this is accompanied by other signs such as lethargy, decreased alertness such as closing of the eyelids and usually thin body condition. As for the photo, it is one of my favourites because of the soft yellow tinge to the water created by the setting sun and the way the bird’s tail feathers match the angle and pattern of the splintered bark. The angles and shadows really work well in the photo. I should have done a little fluffing myself with all the cold this past week! Ya, no kidding Lyle! The weather in Calgary has warmed up considerably today so hopefully it’s heading your way soon! I like the photo for all of the reasons you stated, plus the beautiful reflections of both the wood and the bird and the contrast between the lighting on the left and right sides of the photo. You combined all of those elements to create a really beautiful image.